The Titans built an 8-point advantage in the first quarter and led 25-16 at halftime. They kept the Wildcats’ offense at bay in the second half and held on for the victory. Chloe Wong led San Marino with 17 points, 10 rebounds, 10 steals and five assists, and Kyli Bonavich added 12 points, 12 rebounds, five steals and four assists. Elaina Lee finished with 12 points, six steals and five rebounds, Angel Zhou scored two points and recorded three steals, Emily Thai contributed a point, Maddie Emmons finished with four rebounds and two steals, and Angelina Karapetyan recorded three steals. 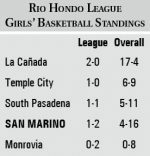 The Titans (4-16 overall record, 1-2 in league) traveled to La Cañada for a league matchup on Tuesday and will continue Rio Hondo League play at South Pasadena on Tuesday, Jan. 22, at 5:15 p.m.
San Marino guard/forward Emily Ting grabbed two rebounds in the Titans’ win last Tuesday. 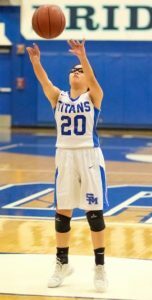 Freshman Elaina Lee netted 12 points and recorded six steals in the Titans’ first Rio Hondo League win. The Titans were unable to recover from a rough second quarter and ultimately fell to visiting Temple City, 38-24, last Friday. San Marino trailed by only two points in the first quarter but its offense struggled to keep up in the second quarter, allowing Temple City to go on a 12-2 run and build a 20-8 lead at the half. The Titans managed to chip away at the lead in the third quarter, but the Rams’ defense stepped up in the final eight minutes to come away with the win. 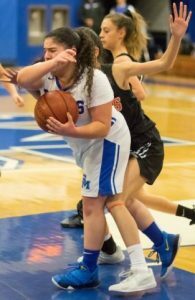 Elaina Lee led SMHS with nine points and two steals, and Kylie Bonavich added six points, seven rebounds, two steals and two assists. Angelina Karapetyan netted five points and Chloe Wong scored four points, grabbed five rebounds and recorded five assists.